As explained in Chapters 4 through 7, the biological oxygen demand (BOD) loading can be the limiting design factor for pond, aquatic, and wetland systems. The basis for these limits is the maintenance of aerobic conditions within the upper water column in the unit and the resulting control of odors. The natural sources of dissolved oxygen (DO) in these systems are surface reaeration and photosynthetic oxygenation. Surface reaeration can be significant under windy conditions or if surface turbulence is created by mechanical means. Observation has shown that the DO in unaerated wastewater ponds varies almost directly with the level of photosynthetic activity, being low at night and early morning, and rising to a peak in the early afternoon. The phytosynthetic responses of algae are controlled by the presence of light, the temperature of the liquid, and the availability of nutrients and other growth factors. Because algae are difficult to remove and can represent an unacceptable level of suspended solids in the effluent, some pond and aquaculture processes utilize mechanical aeration as the oxygen source. In partially mixed aerated ponds, the increased depth of the pond and the partial mixing of the somewhat turbid contents limit the development of algae as compared to a facultative pond. Most wetland systems (Chapters 6 and 7) restrict algae growth, as the vegetation limits the penetration of light to the water column. Emergent plant species used in wetlands treatment have the unique capability to transmit oxygen from the leaf to the plant root. These plants do not themselves remove the BOD directly; rather, they serve as hosts for a variety of attached growth organisms, and it is this microbial activity that is primarily responsible for the organic decomposition. The stems, stalks, roots, and rhizomes of the emergent varieties provide the necessary surfaces. This dependence requires a relatively shallow reactor and a relatively low flow velocity to ensure optimum contact opportunities between the wastewater and the attached microbial growth. a These values were determined by dividing the annual rate by 365 days. Wu et al. (2001) reported that little oxygen escaped from the roots of Typha latifolia in a constructed wetland, and in this system the major pathway of oxygen was atmospheric diffusion. These results were reported to be species specific, and other results for Spartina pectinata by Wu et al. (2000) indicate that the potential oxygen release could be 15 times that for T. latifolia. They also concluded that the amount of oxygen transferred to the wetlands through macrophyte roots and atmospheric diffusion were relatively small compared to the amount of oxygen required to oxidize ammonia. The BOD of the wastewater or sludge is seldom the limiting design factor for the land treatment processes described in Chapter 8. Other factors, such as nitrogen, metals, toxics, or the hydraulic capacity of the soils, control the design so the system almost never approaches the upper limits for successful biodegradation of organics. Table 3.2 presents typical organic loadings for natural treatment systems. The suspended solids content of wastewater is not usually a limiting factor for design, but the improper management of solids within the system can result in process failure. One critical concern for both aquatic and terrestrial systems is the attainment of proper distribution of solids within the treatment reactor. The use of inlet diffusers in ponds, step feed (multiple inlets) in wetland channels, and higher pressure sprinklers in industrial overland-flow systems is intended to achieve a more uniform distribution of solids and avoid anaerobic conditions at the head of the process. The removal of suspended solids in pond systems depends primarily on gravity sedimentation, and, as mentioned previously, algae can be a concern in some situations. 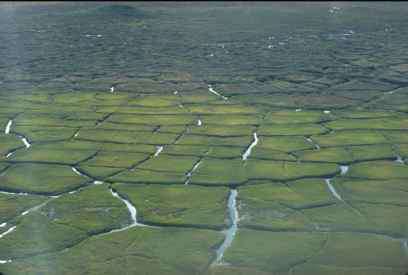 Sedimentation and entrapment in the microbial growths are both contributing factors in wetland and overland-flow processes. Filtration in the soil matrix is the principal mechanism for SR and SAT systems. Removal expectations for the various processes are listed in Table 1.1, Table 1.2, and Table 1.3. Removal will typically exceed secondary treatment levels, except for some of the pond systems that contain algal solids in their effluents.